The church of St Mary the Virgin in Salford is situated to the south of the small hamlet of Salford on the Wavendon Road. 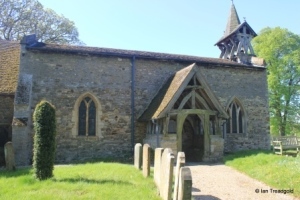 Parking is difficult around the church and access to the church is via a Lych gate beside a private driveway. The church consists of a chancel, nave, south aisle, bellcote, north porch and vestry to the north of the chancel. 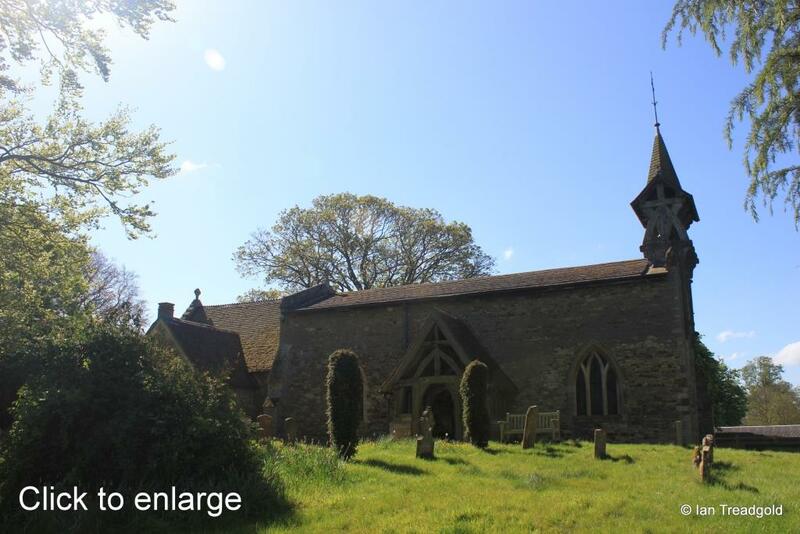 The chancel is around 25 feet by 14 with the nave adding a further 47 feet by 16. The south aisle is around 8 feet wide. 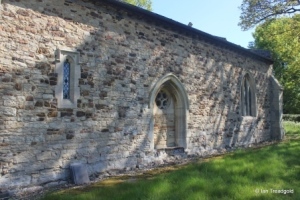 Whilst records of a church on the site date back to the mid C13, the nave and south aisle date from the late C13 with the chancel being added in C14. 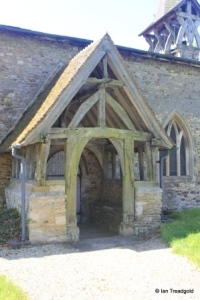 The largely wooden porch could well date back to C13 but was extensively repaired in C17. 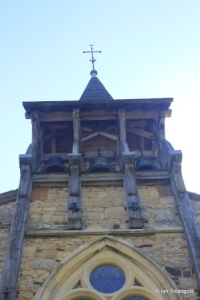 The current wooden frame for the three bells dates back to C19 having replaced a low masonry tower at that time. 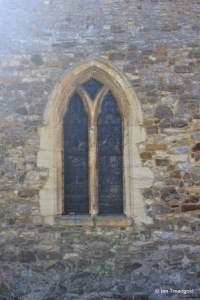 The south aisle has a window to the east and two south facing windows surrounding the blocked south doorway. The east window of the south aisle is of three elongated cinquefoiled lights with quatrefoil tracery above under a pointed arch. 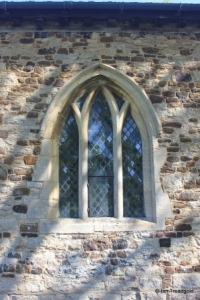 The eastern window of the south aisle is a modern window of three plain lancets under a two-centred arch. 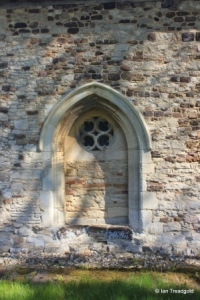 The south doorway was blocked during restorations in C19 and now has a circular window with four quatrefoil designs. 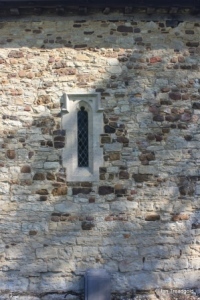 The other window in the south aisle is a modern single lancet window under a square head. The original steeple of the church was replaced in around 1760 with a small brick tower with corner pinnacles and a pyramid roof. 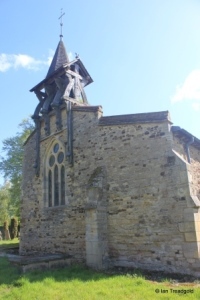 This in turn was replaced with the current open wooden bellcote and shingled spire during the C19 restorations. 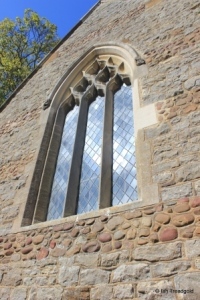 The west window although a modern restoration retains the form of the window prior to the removal of the tower. The north side of the church has windows either side of the wooden porch. 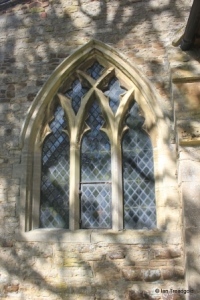 The western window is of three plain lancets under a pointed arc. 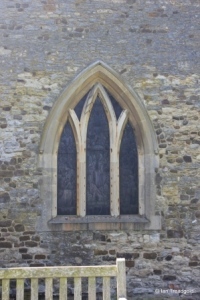 The eastern window is of two trefoiled lights with a pierced spandrel above under a two-centred arch. 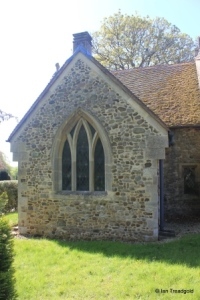 The porch between the windows rests on low masonry walls and was restored in 1633 as indicated by a date on one of the beams although much of the porch is of earlier origin. 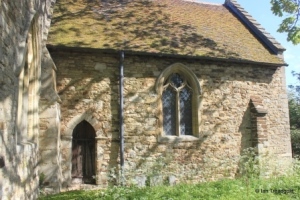 The north vestry is modern dating from 1900 and occupies the north side of the chancel. 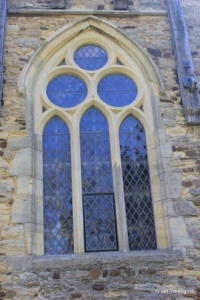 The restored east window is of three trefoiled lights with net tracery above under a two-centred arch. The south side of the chancel has a single window of two trefoiled lights with a quatrefoil design above under a two-centred arch. The plain priest’s door seems to be of the same age as the chancel itself.